I found a two-year-old email from Elliot Hirsch at Ad Yapper the other day. Talk about tenacity. This guy is on a mission. Since then we’ve shared many more meetings, and emails, and even some referrals I’ve pulled together. 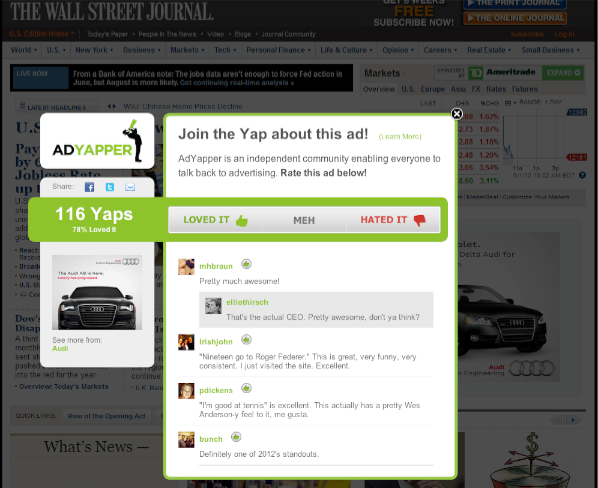 And all the Ad Yapping hard work is paying off as Ad Yapper was recently selected as part of Tech Stars NYC 2013 class. Ad Yapper is an online media measurement that allows a brand’s audience to participating by comment and rating an ad’s overall effectiveness. Regarding Tech Stars, from a pool of 1700 applicants from everywhere, Ad Yapper is one of 11 companies to participate. TechStars is the #1 startup accelerator in the world. We’re very selective – Although thousands of companies apply each year, we only invest our money and time in about ten companies per program location. We have selection rates lower than the Ivy League, so you have to be among the best of the best to earn investment from TechStars. For more on Ad Yapper check them out here. It’s pretty cool. Congratulations gentlemen.